In the wake of the overwhelmingly positive response by students to the Quanser Driving Simulator and the remarkable ability of this immersive 3D environment and simulation to provide an engaging platform for learning control theory, Quanser took the opportunity to go to the next level. To really emphasize the unique potential that the platform has to engage students in control systems design and development from the ground up, we decided to hand off the project to senior design students at the University of New Mexico. The students were asked to help Quanser innovate the way flight control is taught. They were tasked to design an educational platform that is industrially relevant, exciting and engaging; utilizes Hardware-in-the-Loop components; and relates to classic engineering concepts and practices. We provided them with several Quanser tools and devices, including our 2 DOF Helicopter and Rapid Control Prototyping (RCP) Toolkit with the Quanser 3D Viewer visualization software. Quanser engineers then mentored the team throughout the design process. with the simulation and its controls. The students aimed to design a platform that was as pedagogically rigorous as it was engaging. This was important because a great many game-style educational tools are dismissed by serious students. They also knew that the resulting 3D helicopter visualization had to be immersive and realistic, yet simple to control. To get them off to a proper start, Quanser engineers outlined key success criteria. The first requirement was hardware-in-the-loop components, including the Quanser 2 DOF Helicopter. The 2 DOF Helicopter combined realistic model dynamics and ease of use, and helped ensure the undergraduate students had a serious and industrially-relevant learning experience. For the second requirement, the capstone team had to create a repeatable, close-loop course for the virtual helicopter to follow that would allow students to develop and test the low level control systems and the high level navigation algorithms. Once these criteria were set, the students went to work on design and development, consulting with Quanser engineers and their instructors when necessary. The students went one step further and added complexity to their challenge by implementing an exciting helicopter-and-car chase capability. This was achieved by integrating code from the Quanser Driving Simulator. Speaking for the UNM capstone team, Kurt Hollowell summed up their experience. “The Quanser (RCP) Toolkit gave us the functionality to control the helicopter at a basic level through LabVIEW™. We were able to change various inputs to the helicopter, as well as view helicopter state outputs such as current pitch and yaw readings, changes over time, and so on. “Quanser’s visualization software allowed us to easily work with the models within our simulation. We were able to import, scale, and change the models as needed all in one place, which seamlessly integrated with the rest of our system. Ultimately, the toolset gave us the power to perform quick iterations during the development of our project." The capstone project student team from the University of New Mexico includes (left to right) Edgar Chavez (CE), Mitch Castillo (EE), Davie Torres (EE), and Kurt Hollowell (CE). 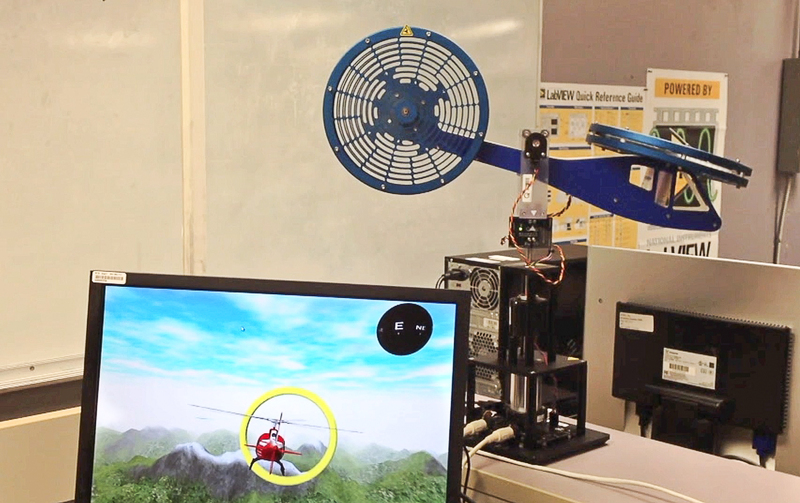 As a platform for control systems education, the 2 DOF helicopter system and the simulation provided by the UNM capstone students now facilitates several flight scenarios for future users, including free flying over a never-ending environment, flying through ring courses, pursuing a car on the ground, and more. Overall, the system gives control systems and engineering students the opportunity to have a realistic and engaging hands-on learning experience. The development of a complete courseware offering by these 4th year engineering students was accomplished in only 7 months, a testament to the effectiveness of the Quanser rapid control prototyping tools, the design process and the abilities of the students. We believe the successful completion of this capstone project will lead to a vivid new way to bring control theory to life in the lab. It has already enhanced the students’ ability to succeed in their academic and industrial careers.